While there are several OTC and prescribed medications for scabies, many people use home remedies to manage the symptoms. Home remedies like tea tree oil, aloe vera and turmeric are beneficial and soothe the symptoms like itch and rashes. Thanks to their antibacterial and soothing properties. After analyzing tea tree oil as scabies medication, here we are going to find out if aloe vera can really manage the symptoms of scabies. Aloe vera is known as a “wonder plant” and is characterized by its short-stemmed shrub. The leaves of the plants are erect and succulent. They contain a gel like substance beneath their green surface. The plant has been known for its healing properties for thousands of years. Many ancient medical scriptures have recorded the medicinal properties of aloe vera. In ancient China and Egypt, the plant was used to treat burns, wounds and fever. Legend has it that Alexander the Great has ordered aloe vera to treat wounded soldiers in the battle of Socotra. Cleopatra was said to use aloe in her skin care. What Make Aloe Vera Beneficial for Health? Aloe vera has more than 200 biologically active, naturally-occurring ingredients like vitamins, enzymes, amino acids, polysaccharides and minerals. This is why the plant is useful for digestion, skin, detoxification and immune system. The plant has long-lasting soothing effect and promotes the growth of new and healthy skin as well. It isfound that aloe vera can heals the bad wounds and burns in 15 days—which is faster than prescribed medications. No wonder why the plant is used in many skincare and health products. How Aloe Vera Manage the Scabies Symptoms? Scabies is a contagious disease which causes intense itch and skin rashes. Give that aloe vera is a great skin healer and antibacterial in nature, it can be useful for scabies. It can eliminate the mites and promote skin healing. It has been proved that aloe vera can effectively penetrate the three layers of the skin. This way, the herbs and vitamins can be easily absorbed by the skin. 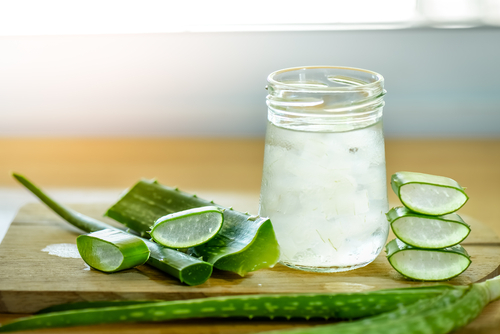 According to a 2009 study, aloe vera is as successful as benzyl benzoate (a common medication) in treating scabies without causing any adverse effects. Another benefit is that it heals the skin from the bottom layer up and promotes new skin growth. It’s cool and jelly like substance moisturizes the skin, thereby soothing the scabies itch. How to Use Aloe Vera for Scabies? So you must have understood that aloe vera is an effective remedy for scabies. You can extract the gel by yourself or purchase commercial scabies gel available at any retail stores. Peel off a fresh aloe leaf to get the gel like substance. Repeat the process two to three times a day for a few days to see an improvement in your scabies. Aloe vera is effective for mild scabies symptoms. However, you shouldn’t rely completely on this natural treatment. If you are not seeing improvement or the severity increases, see your doctor as soon as possible. Or you can use OTC treatment like Dr. Scabies to treat your scabies. Again, see your doctor if your OTC or home treatment fails to work. Apart from taking medication, make sure to follow the precautions. How aloe vera did soothe your scabies? Let us know by commenting below. This entry was posted in Scabies Natural Ingredients, Scabies Natural Treatment, scabies treatment. Bookmark the permalink.